Clean fish and make two diagonal cuts on each side. Wipe dry. Combine the tapioca flour, salt, pepper and chilli powder and sprinkle over the fish. 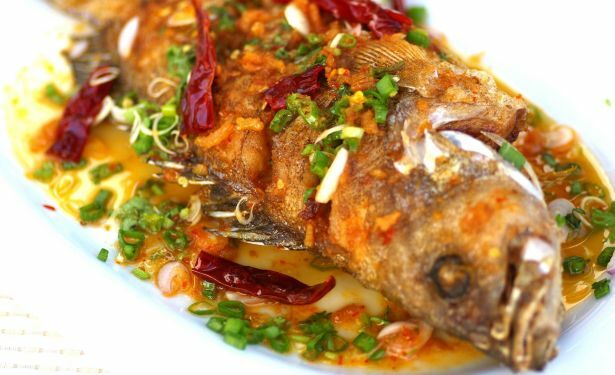 Deep-fry fish in hot oil until golden. Drain well and place on a serving plate. Combine ingredients (A) in a food processor. Whizz to blend until fine. Heat 3-4 tablespoons oil in a wok and fry blended ingredients until fragrant. Dish out and leave aside. Mix sauce (B) with 2 tablespoons of the fried spice chilli paste (A). Add sauce ingredients (C) to mix. Pour the mixture over the fried fish and serve immediately.